If you woulda told me that I'd be putting up two Papoose posts in a year (let alone a month), I woulda thought you were loco. Especially if you added that one would be a review. But, here we are. And here we go. Pap has had a fluctuating buzz for the last decade or so. But this underground king (literally, he won the Justo Mixtape Award for Best Underground Artist in 2005) made sure that 30+ tapes later, we know that he is still the lyrical leviathan from his Alphabetical Slaughter days. Cigar Society is a carefully crafted 9 track mixtape that showcases Pap's lyrical and thematic versatility. 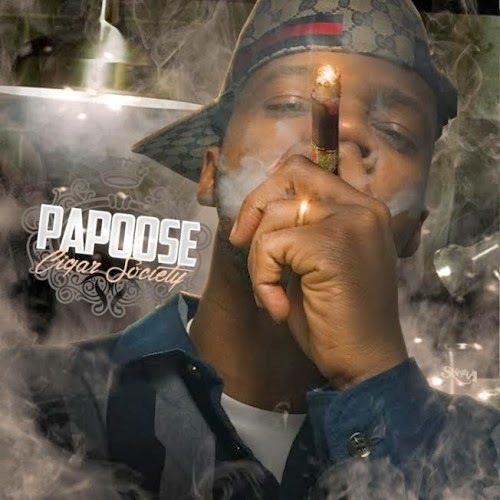 In addition to having a mighty pen, Papoose has always been surrounded by great production. His umpteenth mixtape is no exception. Pap's first verse in the Lux assisted intro track, Likewise, is vintage Pap: "a man come out of jail, you give em some dollars/ but won't give a man nothing when he come out of college". Loaded Lux has made a smooth transition from the battle rap scene to studio artist, and pairs well lyrically with Papoose. Both are very introspective and intelligent. Prisoner is a hood saga track with the OG Prodigy. Both emcees paint a vivid narrative of the street life and consequences. Accompanied by a melodic instrumental and eerie soulful chorus sample, make this is one of the strongest tracks conceptually. My favorite track (for now) is True Believers featuring Raekwon. The track itself gives me that 90s vibe, especially since Pap and Rae start off the chorus with a classic Jadakiss and Styles P back and forth. The Chef is one of my favorite emcees so hearing the living legend on any track is a gift. But Pap really steps it up lyrically and hold his own. If your head ain't nodding through this one, check your neck homey. Papoose purists love everything the emcee puts out. But I feel Pap suffered from quantity over quality as of late. I was an immediate fan of Pap because he appeared to be the next generation of the conscience emcee. All his mixtapes have studio quality production and he often spit on instrumentals better than the original rappers. He could give us thought provoking verses like from the Law Library series, and still go straight gutta with Hustle Hard. And of course go super saiyan level 9 billion with Alphabetical Slaughter. Thankfully Pap veered away from the excess club bangers and really took time to create tracks that are cohesive and well thought out. Lyrically you can't tell Pap nothing. I am very pleased to see that he went back to his old ways and just focused on lyrics. This is easily one of his best mixtapes in recent memory. If you're a loyal fan or just a casual follower, pick this one up.